Casagrande Press is holding a photo contest to find the best bicycle crash shots. That's right, the press is only accepting pictures of people crashing on bicycles. Do you have a wild shot of a bicycle crash, painful collision, or someone spilling over the handle bars of non-motorized bike? (No motorcycle shots accepted.) If so, follow the submission guidelines below. The first prize winner will receive $500 and their image will be used as the cover for a new book to be released in May 2007 entitled Cycling's Greatest Misadventures. Ten runner-ups will receive $50 as well as publication of their image in the book. 3) A full caption of the photograph including the photographer's name, the name of the person who owns the rights to the image, and the rider's name and contact information (if you have it). 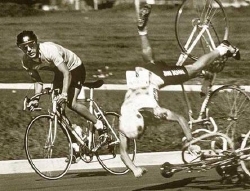 Send submissions to casagrandepress@aol.com with the subject "Bike Crash Photo Contest." Good luck! For more information on Cycling's Greatest Misadventures see www.casagrandepress.com. Casagrande Press reserves the right to select no winners should the photographs received be of unusable quality.